December 19th, 2014 | Lifestyle. You’ve moved in just in time for the holidays-now what? In an earlier post, we covered some details about throwing a housewarming party. While a housewarming party offers a great opportunity to meet new people, there are different ways to branch out and solidify friendships with those who live just around the corner. Neighbors move from house to house together and enjoy one another’s food and company. If you want to host a progressive holiday dinner party to meet new neighbors and make new friends, follow the steps below to pull it off without a sweat. How do you want to split the courses? Who do you want to dine with? What do you want to serve? If you’re new to your neighborhood, it’s important to plan out everything in detail so you don’t overwhelm the other hosts-or yourself. Travel around and meet your neighbors. Talk with them about the idea. Ask for input. After you’ve assessed your neighbors’ interest level, start planning. Usually, progressive dinner parties involve anywhere from five to six couples. Once you decide who to invite, contact everyone and ask them to meet with you to decide who will handle which course. When you meet with your guests to plan, have a list nearby with options. Decide which things you will prepare and how long you’ll stay at each house. Help come up with ideas for entertainment during each round of the dinner party. Suggest easy-to-make recipes, and set a specific night that works for each couple. Once you’ve determined who is in charge of each meal, start preparing the meal you’ll host. The holidays afford plenty of seasoned flavors that make everyone want to gather around the hearth and enjoy the atmosphere of good cheer and great cuisine. 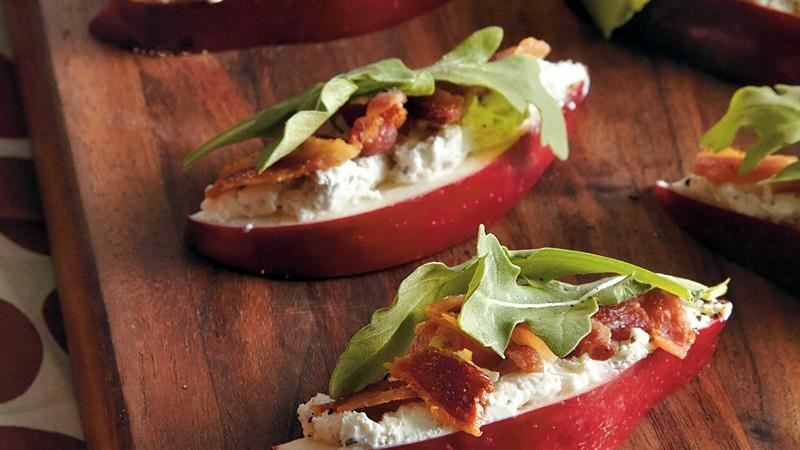 Depending on your assigned course, here are some recipes you might want to try. In a mixer, beat the egg yolks and add the sugar. 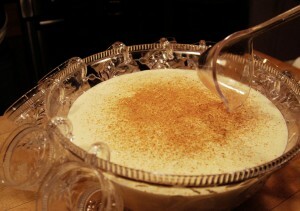 Once the sugar dissolves, add the milk, cream, nutmeg, and cinnamon. Next, beat the egg whites in another mixer and then add to the first mixture. Chill and serve. Makes 12 cups. Cover the apples in lemon juice so they don’t brown. Next, mix the garlic and other herbs into the spreadable cheese (or buy a cheese that already has mixed-in herbs). Spread the cheese onto each apple slice and then top with bacon, arugula, pepper and salt. The queen of hearty cuisine and celebrations, Martha Stewart, lists dozens of main dish recipes for the holidays. She combines unique flavors with rare vegetables and mouthwatering meats. Each of her concoctions will amaze your guests and may even persuade a few of them to set up future dinner appointments at your home. Making and keeping new friends just got a whole lot easier with Martha’s help. 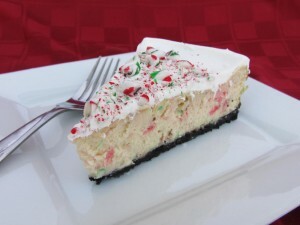 You can win your guests over with one of the most surprising and satisfying desserts of the season: candy cane cheesecake. Not only will this delicious dessert surprise your guests’ taste buds, it will help them remember how sweet the holidays are supposed to be. Food? Check. Decorations? Check. Party time? Check. Once you’ve prepared for the evening, sit back, relax, and enjoy your progressive holiday dinner party. Meet with your fellow hosts and travel to each house together. Sing carols along the way. Do whatever you can to solidify friendships and have a good time. If any of you have children, pool money together and hire a babysitter for the night. Invite the babysitter to play holiday games with your children. Help make it a night for them to remember as well. Whatever you do, make sure you have the entire evening free to socialize and enjoy the wonderful feeling of Christmas. Progressive dinners are one of the best ways to get to know different people and feel right at home in the presence of your neighbors. Start planning your progressive dinner with your new neighbors today.